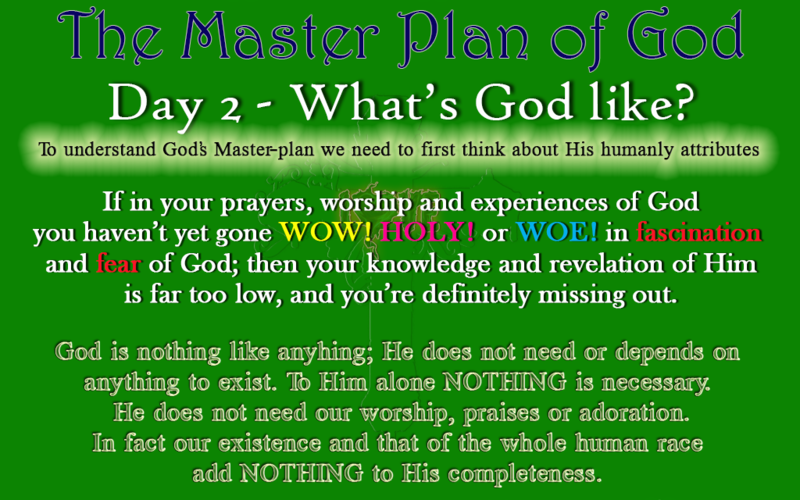 Week 2, Day 2 – What’s God Like? I Have Loved You With An Everlasting Love; You Are Precious And Honoured In My Sight Because I Love You….God, The Father. If so far in your Christian walk you haven’t shuddered in your thoughts of God or been in fear, that’s right; as in AFRAID of Who He Is and What’s He like, then your knowledge and revelation of God is far off too low. God (The Father) is nothing like anything; He is a Consuming fire whom no one has seen nor can see. But through Christ we see what He’s like in His “Humanly” attributes and character. I say “humanly” referring to everything that the human mind and heart is able to comprehend about God, and not necessarily that humans are capable of those attributes. E.g The omnipotent & omnipresence attributes of God are Humanly attributes because we are able to comprehend (to a limit) those about of His being but no human could posses those attributes. One of His humanly attributes like Isaiah said is that He knows the end from the beginning; meaning He knows everything about everything from the beginning to the end. He does not look into a “glass ball” to see or tell the future. He sees and knows the future from the past and sees the past from the future. That’s right He is the beginning and the end and everything find it’s existence in Him. He is self-existence and self-sufficiency; again a humanly attributes. He does not depend on anyone or anything to exist. Some humans can act to appear so powerful and fearful but if you were to deprive them of simple substances such as food and water; those people would simply die. Why? because no matter how powerful they are they need something outside of themselves to exist/sustain their life; even something as simple as food and water. But not God; the only thing necessary for Him is Himself. He exists within Himself and nothing is necessary for Him. He cannot be elevated nor degraded. Nothing is above Him nor beyond Him. He does not need anything nor anyone; If every man on the planet were to become atheist, it could not affect Him in anyway and neither would it add anything to Him if every man were to believe and follow Him. Our coming to know Him add NOTHING to His perfection. Our worship and praises of Him contributes NOTHING to who He is. He does not need us and there’s NOTHING we could say, do or be to add to His completeness. Our existence does not magnify nor diminishes His greatness. He NEVER makes mistakes and NEVER changes His mind; YES! NEVER changes His mind (if you’ve only even looked at your bible; you’ll notice this seems to be a contradiction cos God changes his mind all the time in His dealing with man). The TRUTH of the matter is, He NEVER changes His mind nor His stance on Who He Is and His eternal plans. YES! His plans stand firm and true throughout the ages. What He’s purposed in His heart; He will bring it to pass; No man on earth; No angel in heaven and no demon or devil in hell would be able to stop His purposes especially His master plan which He masterminded before creating the world from coming to pass. THIS IS OUR GOD! HE IS WHAT HE IS IN HIMSELF WITHOUT REGARD TO ANY OTHER. These are only a few of His humanly attributes which means there are parts of his being that’s beyond our comprehension; Anything you could possibly imagine God being; He’ll be far beyond that. One of His non-humanly attributes is “I DON’T KNOW”. And we’ll be forever growing in the knowledge of His “I don’t knowness” even throughout the age to come. Today, I want us to prayerfully think about What God’s like? Asking Him to reveal and fascinate us about Who He Is and what He’s like. He is so BEAUTIFUL. The purpose for today’s devotional is to rightly put where God belongs in our mind’s eye; (i.e. ABOVE ALL). So that in light of last week devotiona and this week; we’ll rightly understand that MAN is not the focal point; GOD Is. ECCLESIASTES 3:12 – I know that everything God does will endure forever; nothing can be added to it and nothing taken from it. God does it so that people will fear him. Heavenly father, we understand that in your being you far transcends anything and everything. But in all of who you are; you still continue to reveal yourself to us that we may know you. Father, we humbly come before you and ask that you shutter every limit and false ideas we have of you. Father, we ask that you come like fire; Come like wind; come like thunder and flashes of light to break the wall of limitation we’ve placed on you. We want to see and know you as you are; as much as our capacity could comprehend. Fascinate us with your beauty that we may tremble in godly fear of your glorious majesty so that like David, Ezekiel, Isaiah, Daniel and John we may also fall face down at your feet and go WOW!, HOLY!, WOE!!! What is man that you’re mindful of; the son of man that you cared for. In Jesus name we pray. AMEN.